It has been some time that I had some ideas regarding different devices. My first try was with the so famous “Mysterious Device” that we had during Tokamak 3 and later I played a little bit with my N85 and QtS60. Qt Everywhere: yes, this means a lot of things. For Nokia it means that the same framework will be available for different platforms, for users that they will have more software being developed and for us, developers, that we can bring our software for all the devices that Qt is ported to. Let’s also talk a little bit about platforms: Nokia has been playing with Maemo for some time now and the platform itself is pretty mature. Of course it will have problems but it’s pretty mature and compared to a lot of others out there it’s much better. But Maemo was “confined” to internet tablets…a device that was not good enough to be a netbook and not small enough to be a phone. It was “just” a pocket computer. However the scenario changed and now we have a mobile phone running Maemo out there (N900) and Nokia learned the lesson about how to attract open source developers (just think that while Apple charge developers to get the full SDK and deploy their software, Nokia gives big discounts on new devices for developers). I was pretty sad that I couldn’t go to Maemo Summit and show my ideas to everybody out there and it became worse when I saw that everybody there had their N900 and would be able to create awesome stuff for the device. This is one of the downsides of living in Brazil: it’s almost impossible to get/buy new hardwares without paying huge taxes and the developers program always helped on this matter. Too sad =/. BUT it seems that today was my lucky day! 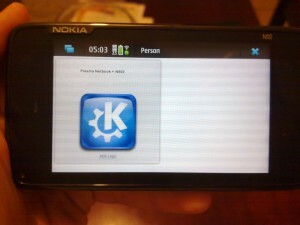 I (and some others) received a mail saying that we would receive a discount on an N900! Awesome! So now it will be possible to do all the stuff I was planning to do! 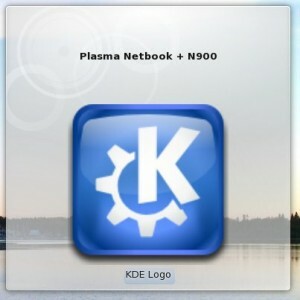 Plasma Netbook is one of my main objectives for the short/mid term (take a look here for the last news). It has a lot of potential and a lot of great ideas around it. We already received good reviews even in “less than alpha” state and we’re looking for companies that want to sell their stuff with something that will provide a unique user experience. If you are interested, contact us…we can explain our ideas and provide details about it. Also know we have Marco working full time on this, while I’m working full time on Qt and others are keeping plasma up to shape. And probably you’re asking yourself why you should be interested in what I said above. The reason is just below. Take a look at the pictures and at the videos. I didn’t use Plasma netbook for this demo because I needed to recompile some stuff and it’s much better in a real netbook. This demo I’ll do during my talk on Latinoware. But for those that can’t go, I’ll talk a little bit: user experience is more than what the user does in front of his computer. It’s all about tasks. Recently, Rob integrated into KDE 4.4 his wonderful SoC called Remote Widgets. This enables two machines to share Plasma content in a very nice and easy way (I don’t even need to say that developers using libplasma get this feature for free, do I ?). For me it was a pretty clear path to go. I want to share my widgets (that helps me during my day-to-day tasks) between different devices, so I can “take” them with me even if I leave my computer. This can be applied to many plasmoids and this is just a demo. I get a plasmoid that is in my desktop and share it with my mobile phone (in this case an N900 that a friend that went to Maemo Summit led me for this weekend). Pretty simple and easy to achieve (ok, it was hard to record the movie, talk and do all the stuff at the same time hehe). For security reasons it asks for pin codes between the two devices (just like bluetooth pairing – and you can have trusted devices too) and you can even save your passwords using KWallet :). Thanks to Mek and Darktears for sharing Qt/KDE compile problems in scratchbox, Vudentz for the device and Aaron and work mates for calming me down when I was compiling all the stuff 🙂 Any questions are welcome and remember that we can extend this a lot! (preempting one question: yes, it’s possible to share the “now playing” plasmoid and control your Amarok from the device 😉 ).